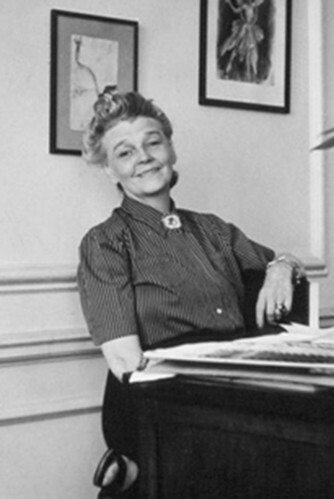 Karinska (1888–1983) was one of most influential costume designers of the 20th century and was particularly famed for her creative partnership with George Balanchine. Karinska was born Varvara Ivanovna Zhmoudska in Kharkov, Russia. She originally trained in embroidery and emigrated to Paris in 1923. She first constructed ballet costumes in 1932 for the debut season of the Ballets Russes de Monte Carlo, which included three works by Balanchine. She quickly won renown for her exquisite craftsmanship, taste and imagination, interpreting dance designs by figures such as Matisse, Picasso, Chagall and Beaton. She moved to New York in 1939 and went on to construct and design costumes for opera, dance, on Broadway and in Hollywood, and in 1948 shared an Academy Award with Dorothy Jeakins for Best Costume Design (Colour) for Victor Fleming’s Joan of Arc. She worked with Balanchine’s company Ballet Society (later New York City Ballet) from its inception in 1946 to the end of her career, and in 1964 devoted her shop exclusively to NYCB. In all over 28 years she created costumes for 48 works for the company. Karinska’s innovations in costume design included a stronger and more flexible tutu. Her dance designs are remarkable for the clarity with which they allow a dancer’s line to be seen, a quality particularly vital for Balanchine's choreographic language.